Photo by Jenny Kirk Two young students are assisted with their shaving cream activity by Southwest Minnesota State University teaching student Kelly Nettik during the second full day of clinical teaching experience on Tuesday at Park Side Elementary. MARSHALL — For more than 35 years, Marshall Public Schools and Southwest Minnesota State University have collaborated to help in the development of future teachers through clinical teaching experiences. On Monday and Tuesday, 34 of those future teachers — current SMSU education majors — completely took over classroom duties at Park Side Elementary. 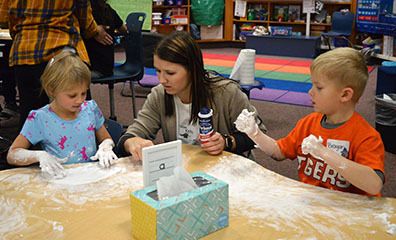 While one classroom had a sports theme where the photos of students in SMSU jerseys were hung up on the Wall of Fame and their lockers were part of the locker room, another classroom was reading under the “Big Top.” Also part of the carnival theme, some kindergarteners were practicing writing their letters in shaving cream. SMSU juniors Alexis Streich and Carly Robillard teamed up to teach in one of the kindergarten classrooms. Streich said she doesn’t take the experience for granted. Streich said one of the biggest challenges is trying to rein in the energetic children. Robillard agreed, noting that the experience includes a huge learning curve. Robillard said she plans to be a special education teacher. Prior to the clinical experience the past two days, Streich thought she might prefer teaching older elementary students. But now, she’s expanded her focus. Robillard and Streich chose “Under the Sea” as their theme, and along with a purple octopus decorating the classroom door, there were several crafts and activities geared along those lines. SMSU Education Professor Dr. Wendy Schoolmeester teaches two sections of the Classroom Management and Theory course and has seen the benefits of the clinical teaching opportunities — both from a professional and personal experience. This year marks the first time that the teaching experience has taken place in the fall. 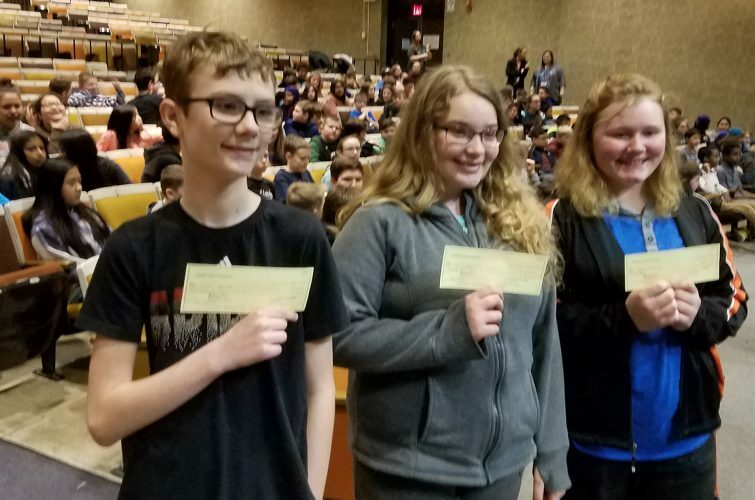 “This is the first time we’ve done it in the fall since I’ve been teaching (at SMSU) and that’s been more than 15 years,” Schoolmeester said. “It’s because of all the testing that has come down. It was sometimes difficult to work with West Side because they have all the (state) testing to do. Last fall, Schoolmeester said she sat down with Love and Jeremy Williams, who was the West Side principal at that time, to discuss other options. The past few years, Schoolmeester said the numbers have dropped, but that they’d oftentimes taken over the whole school in the past. Part of the experience includes an observation piece, which is conducted by retired MPS teachers and current SMSU professors — including Education Professors Dr. Sonya Vierstraete, Dr. Rhonda Bonnstetter and Dr. Lloyd Petersen. Love said the Park Side teachers who vacated their classrooms to allow for the SMSU students to teach for two days also benefit. For much of the time, the teachers get together with others teaching the same grade level. Paraprofessionals continue to work in their regular classrooms. Schoolmeester said Minnesota’s Professional Educator Licensing and Standards Board (PELSB) requires so many hours in the classroom, so the clinical experience helps provide many of them. Schoolmeester said they talk a lot about the theorists of classroom management, but that the SMSU students form their own philosophy of what classroom management is as well. Schoolmeester only recalls one student who decided the teaching profession wasn’t the appropriate career path after taking part in the clinical experience. But there were also other factors at play. Love said that typically by their junior year, the students have a good handle on their chosen career path. Schoolmeester said that field experiences were definitely something SMSU prides itself on. “The students get a lot,” she said.